HDL control is sold separately. MemoChips are shipped with test strips and change color depending upon test panel. Multi-Chemistry Controls contain two different concentration levels used to verify system performance for total cholesterol, triglycerides, LDL, and glucose testing. These multi-chemistry controls enable a wide range of quality control testing for professional and home use, and are the first commercially available, clinical chemistry controls of their kind. 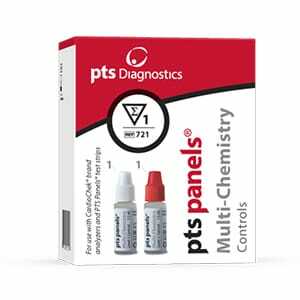 The PTS PANELS Multi-Chemistry Controls contain liquid, ready to use, bi-level (low and high concentration) materials in an easy-to-use, dropper format. This control material has an expiration date of two years when stored at 2 to 8 degrees C (35-46 degrees F). Once opened, the material is stable for four months at room temperature. Use these controls with the CardioChek ST or CardioChek PA. Test Strips as a quality control material to check for proper performance of your test system. The CardioChek ST or CardioChek PA. Multi-Chemistry controls contain cholesterol, triglycerides, and LDL, which reacts with the test strip to produce a color. The darker the color, the higher the chemical concentration is. The result for each level of control should be in the range specified on control range sheet enclosed with the test controls. Controls should be run to verify the test system performance. You should run a control if results obtained are questionable. Do not eat or drink contents. Use for in vitro diagnostic use only. Store at room temperature below 86°F (30°C). Do not freeze. Product is ready to use. Use care not to contaminate dropper tip. Do not use beyond the expiration date on the vial.